Improving processes with Lean Six Sigma is no easy task; it takes hard work and smart thinking. When implementing Lean Six Sigma, always remember that teamwork is key to solving problems. This is true in all industries, from call centers to software development to manufacturing. It is especially true of the latter. But how do we use it to achieve process improvement? How does it help us understand what is and what isn’t working in the business? We find that, sometimes, recapping what you already know is just what you need to gain a better understanding of a subject. Today, you can learn how to use Lean Six Sigma to analyze efficiency and quality within your business. 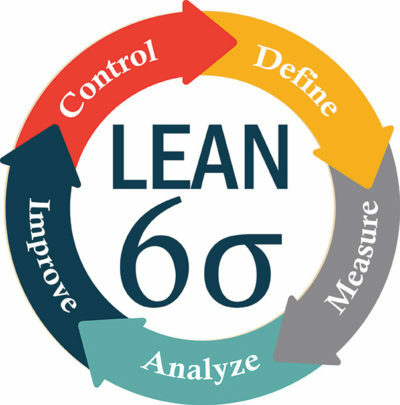 What is Lean Six Sigma? Let’s break down what the term means. Firstly, it refers to a set of principles that aim to improve efficiency. Six Sigma is, of course, another similar improvement strategy used in manufacturing and other industries. They both aim to make businesses more efficient by streamlining processes, removing none-value-adding processes and promoting productivity. The difference between Lean and Six Sigma, however, is that the former aims to eliminate waste (Muda), whereas the latter focuses on minimizing variation to achieve an optimum sigma level. In Lean Six Sigma, we marry the two disciplines together, thus gaining the benefits of both. Lean Six Sigma requires a balanced approach to maintaining quality and removing process waste. Just as in traditional Six Sigma, Master Black Belts are responsible for facilitating Lean Six Sigma improvement techniques. MBBs, along with Black Belts and Green Belts, also handle much of the technical and analytical work involved. Beginning with a systematic analysis and measurement of your operations, they can break them down into their component stages. Lean Six Sigma project teams can then identify where efficiency needs to be improved while creating solutions to correct these problems. Team-based Six Sigma techniques like brainstorming, Root Cause Analysis, DMAIC, and 5 Whys are all essential tools for measuring quality and efficiency. They can help you find the underlying causes of problems and help devise solutions. Analyzing your operations with Lean Six Sigma techniques allows you to gain insight into quality and efficiency. LSS enables you to measure efficiency in ways which will certainly have been unavailable to you before. For example, to improve quality, you need to isolate the factors detrimental to it. As you gradually increase your efficiency with all manner of tasks, from administrative work to the production line, you will increase your bottom line. The added flow of revenue will only benefit your company as you continue throughout the year. Maintaining Lean Six Sigma practices will help stay on top of issues affecting efficiency and quality, which is especially important during times of economic pressure. Not all businesses are the same, and neither are their processes. But, Lean Six Sigma can help you determine your optimum processes via several universal ideas. Firstly, proper client information management is critical as it means your employees will be less likely to run into instances of missing or incorrect data. This helps avoid unwanted pauses and time-loss waste. Similarly, using LSS, you can analyze situations for factors that cause bottlenecks, i.e. where a process becomes backed up. Overcoming these obstacles allows you to maintain progress and minimize delay-based costs. Contact us at 6Sigma.us and find out how we can positively help you plan and change the culture and operations of your organization. We offer Six Sigma Green Belt and Six Sigma Black Belt training programs, as well as a Six Sigma Master Black Belt program.